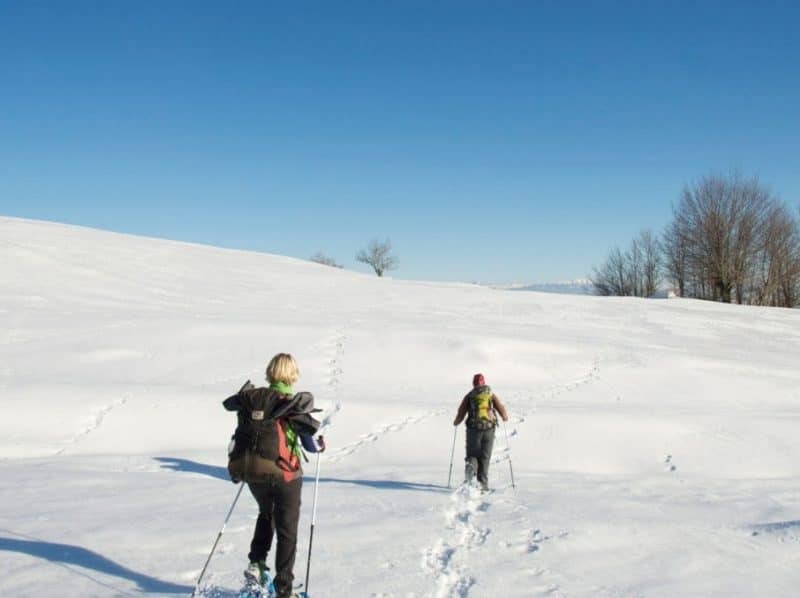 Snowshoeing in Albania is a fascinating trip which combines great mountain scenery, unique insights into the local culture and fantastic snowshoeing routes in the Alps. 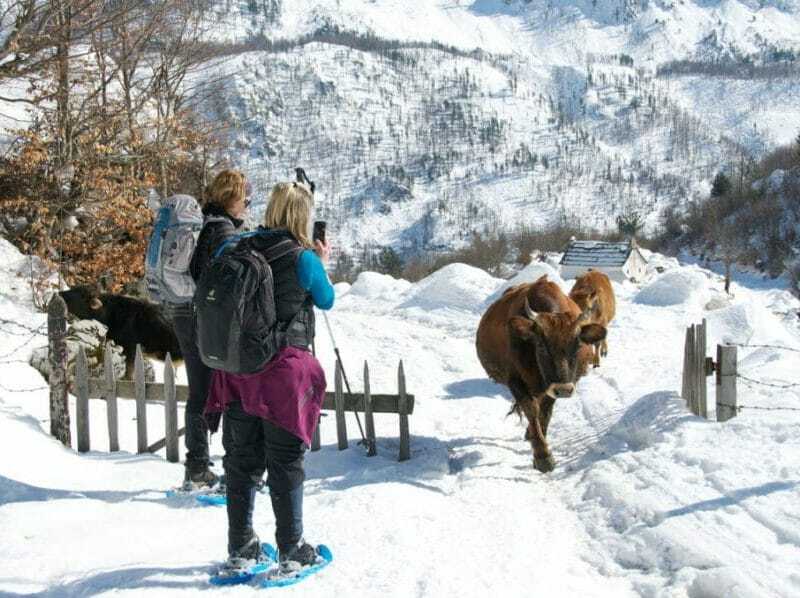 One day will even be spent snowshoeing across the boarder into Kosovo. The group will be met at the airport by our tour leader. Next we transfer to the hotel in Tirana. Depending on the arrival time we can schedule a guided walk through the city center. Breakfast in Tirana. The group starts driving to the heart of the Albanian Alps through the cities of Prizren and Gjakova in Kosovo. On our way to Valbonë we stop for lunch in the city of Gjakova. A break will be taken along the way in the city of Bajram Curri, a small city situated on the foot of Hekura Mountain at an altitude of 2525 meters. 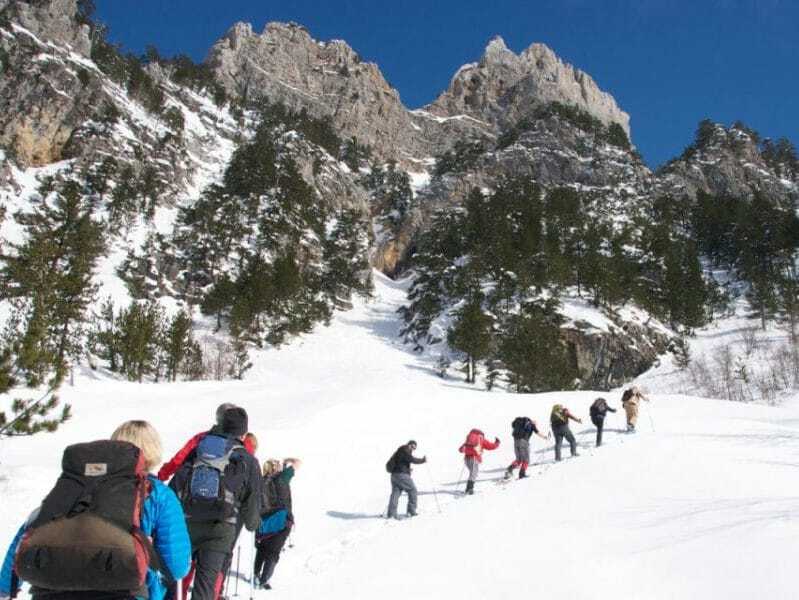 When we arrive in Valbona Valley, there will be a small break at our hotel then an explanatory session about the snowshoes for the first timers. 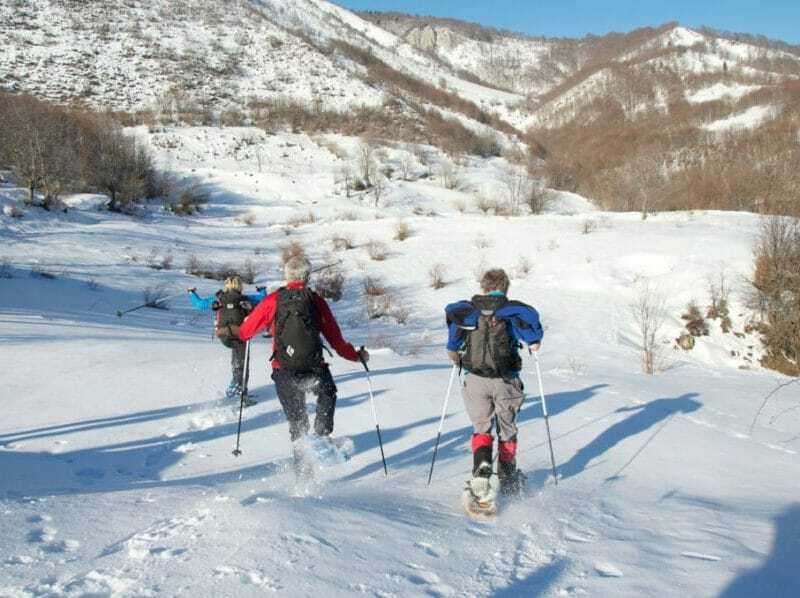 We will test our snowshoes by walking the Valbona riverbed. Breakfast in Valbonë. 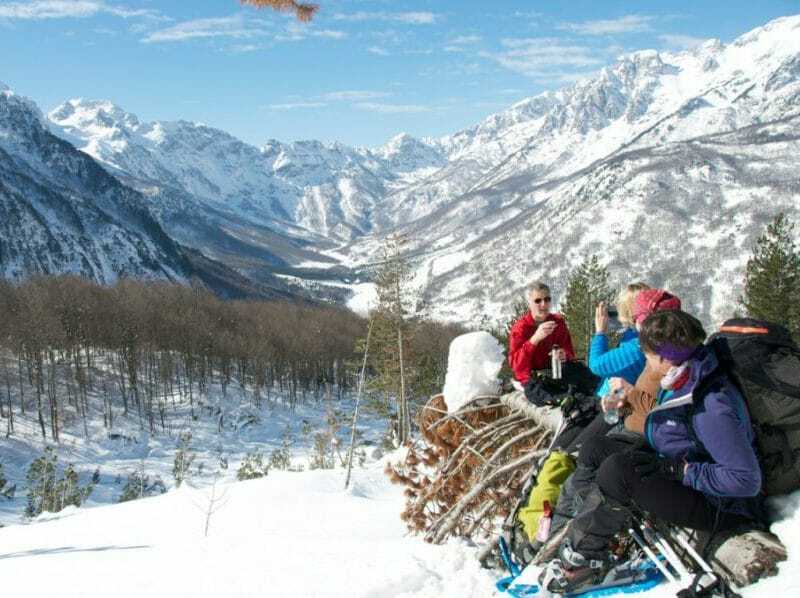 After breakfast we start snowshoeing to Kukaj village along the Valbona riverbed. On the way we can take a break near some old bunkers and explain a bit more about the massive fortification of Albania during the 70’s – 80’s. Next we walk along the road track uphill until we see Jezerca, the 2694 m high peak of the Alps. From there we circle back to the village of Kukaj where a warm welcome complete with hot mountain tea, homemade cheese, and the local alcoholic drink "raki" waits for us. After lunch we head back to the hotel, stopping for coffee along the way. A traditional folk group will perform during dinner. This hike will be more challenging as we will snowshoe up the 2625 meter Grykat e Hapta Mountain. We will begin snowshoeing straight from the hotel at 900 meters and then onto the road tracks for a while. After that, we gently gain more elevation as we cross above the tree line. We will then continue alongside the mountain until we reach the highest point. This is a panorama point from where Valbona valley and the encircling mountains look amazing. After we soak up this spectacular view we begin our descent until we reach our hotel in Valbonë. The distance we will cover will be shorter than the other days, but along the way we will discuss the communist period and how it was for the locals to live under that system. 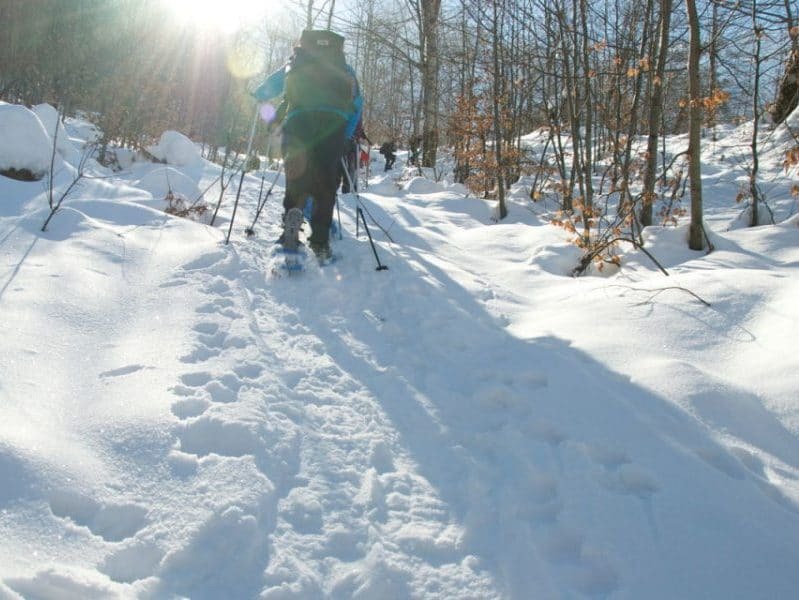 During communism, the government was afraid that people might flee the country by using mountain routes such as those we have been snowshoeing on. Our destination for the day is the village of Rragam. The village is not inhabited during the winter because most of its inhabitants live in the nearby city of Bajram Curri. They come to the village only when the snow melts and the area is more accessible. We have, however, found someone who is going to open for his home to us for lunch. We will walk along valley for about 30 min until we reach the house of our local guide who won't let us leave the valley without stopping for a coffee and raki at his house. Our guide will then lead us along the valley for another hour to where our minibus waits to take us to the city of Bajram Curri for lunch. In the afternoon we will visit a typical north Albanian turret type house. The house belonged to an important Albanian hero called Mic Sokoli who died as he was fighting against the Ottoman Army. In the afternoon we reach the village of Tropojë where we will be accommodated. We will end the day with a walk through the village and have a coffee with the locals. Breakfast in Tropojë village. We drive for 20 min to reach the village of Buçaj. From there, we begin the 3 hour walk through the snow to the village of Padesh. Padesh is a beautiful village surrounded by a wide forest of beech and pine trees at an altitude of 1450 meters. If the weather is clear we can see the wide valley of Tropoja and part of Dukagjini flatland in Kosovo. Lunch will be in a family house in Padesh. After lunch we will walk to Kosovo, crossing over through an old military checkpoint. From the village of Koshare we will drive 30 minutes to the city of Gjakove where will be accommodated and have dinner. Breakfast in Gjakovë. We will spend time in the city and walk through the ottoman Bazaar which has around 500 stores, one of the largest in the Balkans. We will also visit the Hadumi Mosque. After this, we will drive to the historic city of Prizren. Optionally, we can also visit the Orthodox Monastery near Deçan on the way. Prizren is historically one of the most important cities for the Albanians. There we will visit the Sinan Pasha’s mosque, the Orthodox Church and the center. After lunch we continue driving to the city of Tirana where we will spend the night. Breakfast in Tirana. We will transfer to the airport where our tour will end.